...this sunhat from Gap. With straw hats a-plenty on the high street, finding a nice cloth version is a tricky task - until I spotted this one. With its washed-out navy ticking stripes it instantly conjures up the seaside, and at £5.99 in Gap's seasonal clearance (instead of £12.50) it's a small spend for something that's going to get a good dose of sunscreen and sea salt over the summer - and, unlike straw, it's washable, too. 3. Fits in my suitcase? Tick, tick and tick because, unlike more rigid hats, this beauty folds away to virtually nothing, making it a dream to pack. I love its boho floppy style - great for the garden as well as the beach. 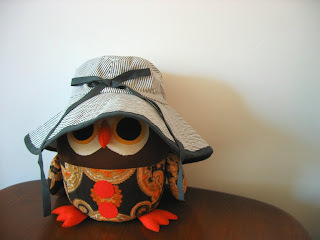 It looks good on Egg the Owl, too! (I added this pic so you could see the hat in true technicolour.) I source vintage/retro toys for my friend Kirsty's card company, Umpen Editions, so if Egg looks vaguely familiar you may just have seen him on the front of a greetings card. I don't want to seem forward or anything but I love your blog and think yours and mine has quite a lot in common - don't know if you are into trading links but if you are, I'd love to chat to you about it! Email me if you like (amy @ desirable.co.uk). I love your blog too. This owl is particularly cute. I could have done with a hat like this on my recent travels. I've got a gorgeous beach hat, but it just won't fit in a suitcase, so it's no good for long haul. I wish I had your time to shop and look for bargains. I love your inspiring ideas.